The weekend of 29th June saw the return of the 10 Peaks event in the Lake District, now with a new headline sponsor, Clif Bar. There was another key addition to this year’s event, the introduction of the “short” course, designed for those competitors that saw the 73km long course, with it’s 5600m of height gain, a step too far. The “short” course would follow the same route as the long but would miss out a few loop sections, cutting down the overall distance to a more manageable 50km. At 4am on Saturday morning 150 long course competitors set out on their epic journey to conquer the 10 highest peaks in the Lake District in under 24 hours. Historically only 33% of the starters would manage to successfully complete the challenge, and that is on a good day – on one occasion not one of the starters finished, although the weather was quite extreme that year! 5am saw just over 60 short course competitors set off in chase of the long coursers. Conditions looked quite reasonable but most of the peaks were expected to be hidden under cloud cover. This proved to be the case for much of the day, but the fresh wind saw to it that every so often the cloud would clear, revealing the spectacular views that the Lake District is renowned for. As the day went on conditions worsened with the wind picking up, mist coming in and drizzle filling the air. The quicker competitors would manage to miss the worst of it but the slower ones would be in for a tough night! Paul West-Watson was the first of the long course competitors to make it to the top of Helvellyn (the first of the 10 peaks), followed closely by last year’s second place finisher, Simon Martland. By the time the leaders had descended Helvellyn however, Luke Fradsham had fought to the front and established a small lead with 10 or so other strong runners all within a few minutes of him. Luke maintained this lead all the way over peaks 2,3,4 and 5 and on to England’s highest peak, Scafell Pike. After bagging Scafell (peak 7), the three lead men all took the “alternative route” to Pillar, heading down in to Wasdale before ascending up Wind Gap and to the summit of Pillar. This route saves a little distance over the standard route (Corridor Route to Great Gable followed by an out and back to Pillar) but builds in a beast of a climb up Wind Gap. Luke remained in 1st position, with Paul 2nd and Tom Hollins in 3rd but nearly 17 minutes behind the leader. By the time the three of them reached the summit of peak 9, Great Gable, Tom had moved into 2nd place having run a great leg from Pillar, and was now only 90 seconds behind Luke. Tom took the lead for the first time on route to the fourth feed station at Honister YHA. 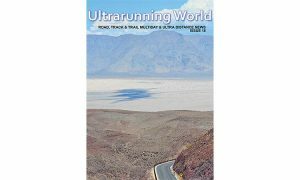 Tom used the knowledge gained from his recent Bob Graham Round to his advantage and pushed on, opening up a lead of 9 minutes over Paul and 15 minutes over Luke. After just 12 hours Tom summited the final peak, Skiddaw, but carried on pushing hard with the course record well within his sights. He finally reached the finish in just under 13hours and 2 minutes, breaking last year’s course record by 25 minutes. Paul West-Watson came home in 2nd place in a time of 13 hours and 23 minutes with Luke Fradsham finishing third in 13.55. The ladies race was a different story entirely, with Angela Armstrong dominating from the start with an incredible performance and overall finish time of a fraction under 15 hours. This time took over 3 hours off the course record that had been set in 2012 and was good enough to place Angela 9th overall. Sam Scott finished 2nd in a very respectable time of 17 hours and 53 minutes with Julie Fewster finishing third in 19 hours. Angela and Tom both received an Active 10 Plus GPS unit together with a map card of the Lakes, as rewards for setting new course records. These units were kindly donated by Satmap. Of the 150 that started the long course, 67 finished within the 24 hour time limit, 6 more went on to finish but exceeded the time limit, 31 retired and 46 opted to switch to the short course whilst on route. The short course soon put pay to anyone’s ideas of it being “the easy option”. 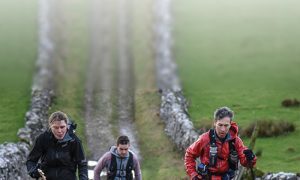 48km of distance and 3200m of ascent, over some of the UK’s most rugged terrain, is a mammoth task in itself, without setting a 24 hour time limit on it. However the two front runners did make it look easy, and had a very close battle long in to the race. Only 13 seconds separated the pair at Scafell Pike but Tony Holland used his vast local knowledge and dug deep, running along the Corridor route to gain nearly 7 minutes on Tim Reid by the time they reached the top of Great Gable. Tony didn’t even stop for a breath at the Honister feed station and raced on up the final peak, Dale Head, before disappearing over the edge to take a little known minor’s track towards the finish. Tony completed the course in 7.54.30 with Tim Reid coming home second in 8.40.17. Tristan Bunn was the third man back in a time of 9.31.14. The ladies short course race almost mirrored the long course, with Sarah Booth leading from the off. 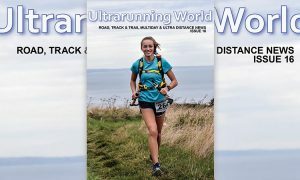 Whilst she was only a few seconds in front of second lady, Morag Willoughby, at the summit of peak number one (Helvellyn), Sarah consistently moved across the ground faster, adding minutes to her lead on every leg. Sarah amassed a buffer of over 3 hours but did not let up, finishing in an amazing time of 12.04.24. Morag Willoughby held on to her second place very well, despite being chased by joint third placed ladies Lorna Young and Maria Silva, who managed to be quicker over a few of the legs but slightly slower overall. Morag finished in 15.32.51 whilst Lorna and Maria crossed the finish line in 16.17.17. In total there were 82 short course finishers, all within the 24 hour time limit. 60 had officially started as short coursers but had been joined by 46 converting long coursers, however 24 out of these 104 retired at some stage along the course. Both sets of statistics (long and short) just go to show how tough these events are. Whilst every year they seem to attract higher level competitors, we are very proud to see that the bulk of competitors are on a personal challenge and we do not wish to lose that “all inclusive” feel to the event. On the weekend of 7th September, We are hosting a 10 Peaks event in the Brecon Beacons, a completely different type of terrain but the same epic test of fitness, stamina and determination. 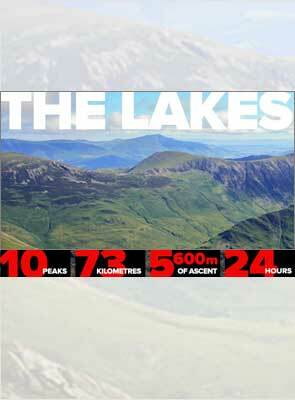 As always, we will be challenging you to take on the 10 highest Peaks in the area within 24 hours. The long course will be 90km and the short 58km, but both will take you through the heart of the stunning Brecon Beacons National Park.